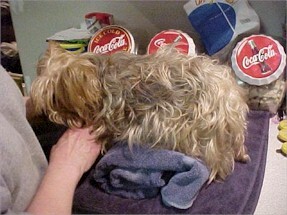 Suzie is a Yorkshire Terrier and I do her bg tests at home by pricking at the base of her tail. 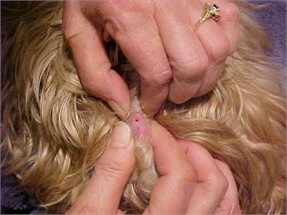 Since Suzie has long hair, I have to shave a small section of hair to be able to get a clear drop of blood. 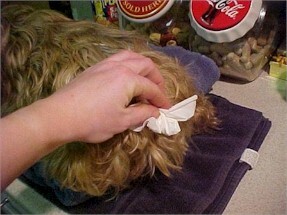 To do that, we use a small electric trimmer (a mustache/beard trimmer would be ok) and lift up a section of hair at the base of her tail, then shave off the hair underneath it. Since it's such a small area, you don't even notice the missing section of hair. I shave the testing area about every 2 weeks or so, as too much stubble makes it so the blood doesn't form a nice droplet to catch in the test strip. 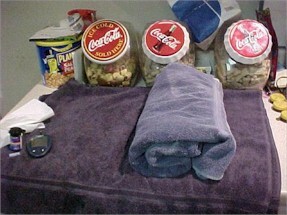 Prepare the test area and all the supplies -- lancet, meter, test strips, tissue. Suzie is on the heavier side, so she tends to try and sit down when we test her. In order to avoid this, I roll up a bath towel and place it under her belly to keep her standing. 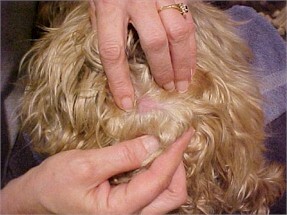 The index finger on the top of the photo is at the base of Suzie's spine, and the thumb seen on the bottom is holding the end of Suzie's docked tail. 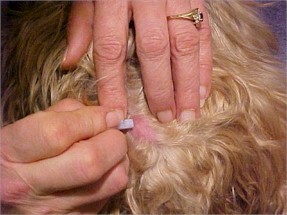 Holding back the fur, I prick the shaved area using the lancet by hand. I don't use the lancing device. Suzie doesn't even flinch when I do the prick. I obtain the drop of blood by gently squeezing where I did the prick. When doing a bg curve (taking multiple readings throughout the day), I can use a warm washcloth and gently rub the area where a previous prick was done. I can then "milk it" -- that's the term for when you either push or squeeze to get the blood to come to the surface -- and it will bleed again fairly easily. 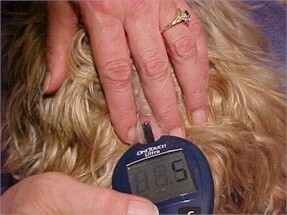 Using the meter with the test strip inserted and ready to go, I collect the drop of blood to get the bg reading. After getting the blood drop, I use a tissue and put a little pressure for about 20-30 seconds to be sure there's no bleeding after the test is done. After her bg test is done Suzie gets a little treat for being such a good girl. Suzie isn't letting diabetes hold her back. Suzie became blind with the cataracts about 1 month after diagnosis. We have two other dogs, an 11- year old old Rottie and a 1- year old old Yorkie named Teddy. Teddy waits at the door when Suzie is out, and when she comes in, he gives her a little nip. After 2 or 3 times, Suzie started charging in the door, snarling and barking, and surprisingly enough she could get him backed up under the table. -- Contributed by Marsha and Suzie, with photos taken by Jennifer (Marsha's daughter).